It’s been an amazingly long time since we have released a development blog, now we have a bigger team and more going on every month, we will release a dev blog including a vlog at the end of every month leading up to release of Jaws of Extinction.  We have a fair bit to show you since our successful Kickstarter campaign – we’re excited to display how far the development has come and how different game-play systems are from the JoE Prototype. Our Private Alpha will be released very soon, so some of you will gain a sneak-peak into the world of Eden-Nadir. We will be going over systems that are game ready and also mechanics that are still a work in progress, but we will try to cover them all from each team members perspective. 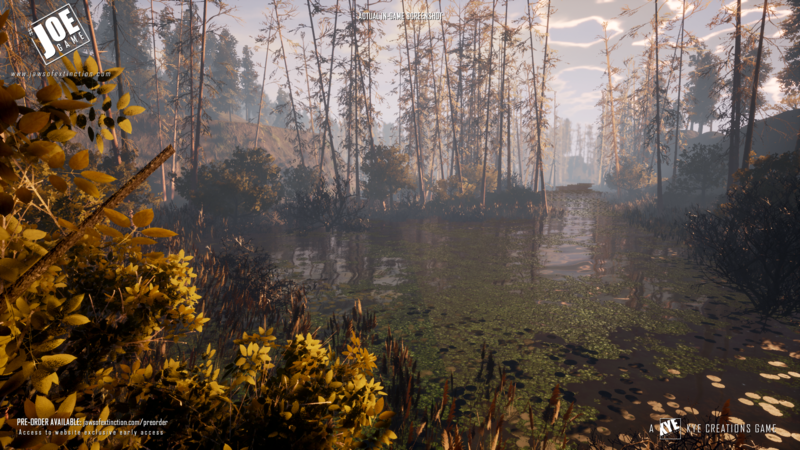 The development of the Eden-Nadir environment started way back in 2016, but with the move from Unreal Engine 4.11.3 (Original Eden-Nadir engine version) to 4.19.2 we decided to start fresh and leave the old world behind. This started with making a brand new landscape shader that was automated, to some degree. This would alow the world to form textures with the geometry more naturally, also allowing us to tweak it by hand painting where it was needed. The landscape of Eden-Nadir is completely hand sculpted, we did not use and third-party generator like world machine. This allowed us to add a lot of detail by hand and be more precise with it’s design. The world has changed quite a bit from our original vision of it, adding in new areas like everglades, new marsh lands and mountain roadways and paths. The way we wanted to layout the landmarks was to ensure that players would not have to walk for long till they passed another place to explore, whether it was a building, campsite or abandoned vehicle there would always be something around the corner. Eden-Nadir is mainly covered by forests, farm lands, marshlands being accompanied by a large city, industrial area’s, towns and villages. The open world is completely fictional but made from some amazing references from the United Kingdom and United States of America. 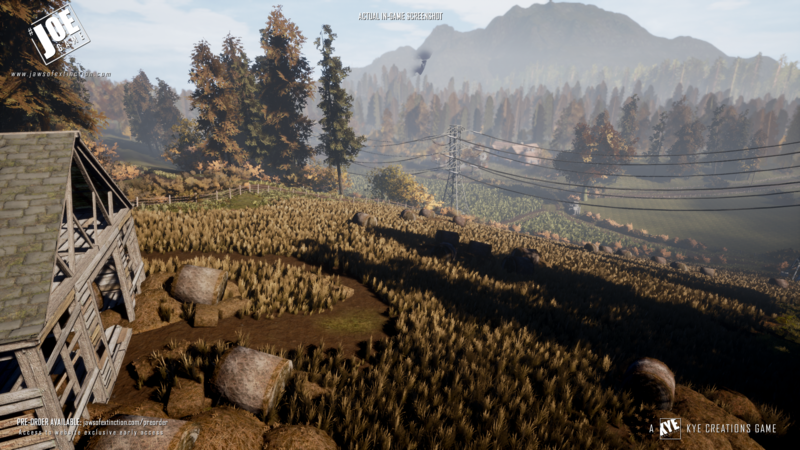 Although we are placing many POIs to discover, we needed a balance, so there still needed to be plenty of areas for players to hide away their bases. 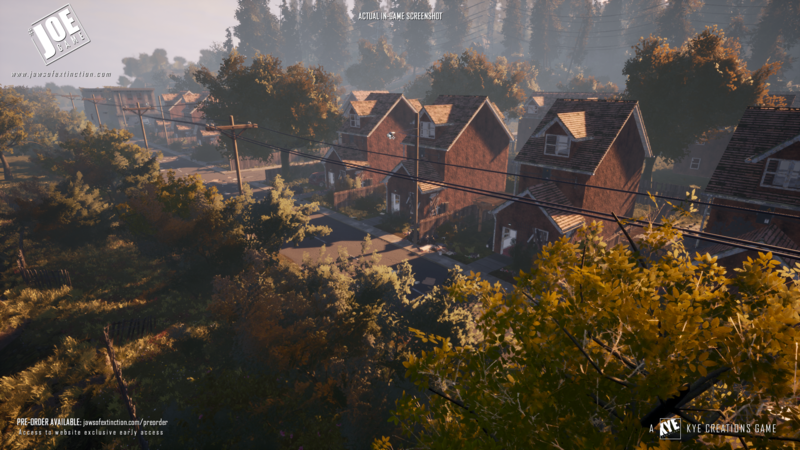 We still have a lot to do on the island, adding in building interiors, finishing telephone lines, street lamps and replacing all the placeholder structures used as size references and visual aids. On the release of our Private Alpha coming very soon, only half the island will be available due to main story elements. 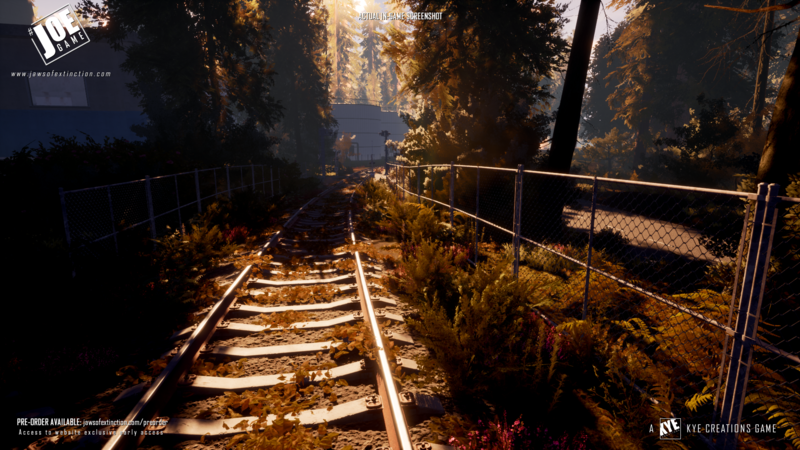 But it will not be long during our website exclusive early access you will be able to explore Eden-Nadir in full. I have also spent a lot of time working with our story artists, Joe & Paul, adding new areas to fit with the story and creating discoverable quests locations for players. We want there to be a little bit of a history to every location you visit, it will be up to the player to find it and follow its path. Scrub and I spent a lot of time fine tuning our seasons and in-game calendar. What we mean by an in-game calendar, is every day that passes while you are playing is an actual day in the year, and the world keeps track of this. The environment changes through the seasons, including trees losing their leaves and foliage changing colour in general, this also includes the grass and the tint of the landscape textures during the dry & warm months. “You will notice in the top left corner of the animated image above a date flashing up as the day cycle passes midnight” – this is just a debug feature and will not display on screen in the main game. There are many reasons we have developed this, for example, even though there will be random events that happen in the world, we also wanted events and quests to only be available at certain times of the year. We also wanted the seasons to not only effect gameplay, but to also affect NPCs in the world, animals and even the wanderers. The time of year will adjust the day length of an in-game day as well as adjust the angle of the sun in the sky, we all hate those winter evenings where the sun blinds you due to it being so low in the sky. Well, we could not leave out the annoying things of life. A survival game is not a survival game without the forces of nature, but not many have full seasonal weather. We have been working on our weather system now before the Jaws of Extinction prototype, creating lists of new effects, to make them GPU dependant as well as visually correct. We did not want just visual effects from the rain drops and snow flakes, we wanted the weather event to change the whole scene for the player. Weather events will decrease visibility, darkening the scene and reducing the players’ view distance. Weather is determined by the season / time of year and cloud density, unfortunately this is a totally random mechanic and there is no way of telling the weather forecast for the next day. Not all of our weather events will be in until we are well into our Early Access period, but we can guarantee rain, thunder & lightning and typical winter storms of harsh winds with hail and snow to back it up. Over the last couple of weeks I have been integrating a new type of looting system. Over time, we’ve discovered that we’re not huge fans of waiting for a spinning wheel to tell you when you’ve finished looting something. So, we’re beginning a transition into a more tangible looting system, which enables players to open and close cupboards which will randomly generate loot depending on your Looting level. This type of interaction will hopefully be transferred to all manner of looting items, and ultimately we wish to integrate this looting behaviour into NPC’s as well. We have also changed the way in which pickup items are handled – Most items you find will be able to be picked up or interacted with. When picking up a spanner or can of tuna, the item will now snap to your hand, which you then pocket into your inventory. We think this adds a nice embellishment to looting and the inventory. Players can now go for a dip! Upon entering water, players will start moving through the liquid at a reasonable pace with breast-stroke. We spent a while getting this to feel right, as we have added an individual impulse to each stroke. You can then transition into front-crawl by pressing Shift if you want to go faster. Additionally, you can now also dive underwater by pressing the crouch button, this will allow you to explore the depths of lakes and seas! We feel entering and leaving water still needs some finessing, however I’m pleased with where the system is currently. First Person firearms are here! First Person lovers will be pleased to know we have now incorporated a First Person perspective to our weapons, as well as a wide range of pistols and assault rifles. In addition to adding a new perspective, we have drastically updated the firearms system itself – with improved aiming, shooting mechanics and animations (character and weapons). We hope these changes make the weapons feel a lot more life-like a fun to shoot. I have been working on replacing all the placeholder structures around Eden-Nadir with Ryan, to ensure that they all fit the look and style of our game. The majority of peaces I have made for Ryan, have been modular, so we can place different variations of the same structure around the island. We wanted to make the world feel lived in and as believable as possible, so making sure that towns and cities had power lines leading from the main power supplies was a must, including telephone lines, radio towers and electrical pylons. One of the biggest modular structures created was Nadir dam, fitting it in the world made us have to rethink its location due to its mammoth size. This all turned out ok in the end, due Ryan pushes the dam back closer to the mountain and creating a reservoir behind the dam, visually it was much more pleasing than its original location. I have been working with KYE Creations as part of the writing team on Jaws of Extinction, for a little over a month now. I recently completed my degree in English Language and Creative Writing, during which I focused on horror-themed literature and furthering my own post-apocalyptic novel. The first thing that caught my attention from Jaws of Extinction was it being marketed as being a story-driven experience, in gaming, this has always been my main draw. Since joining the team I have spent this time researching the game’s lore to get a better understanding of the story and characters within the world. Currently, I am focused on fleshing out the residents of Eden-Nadir to give the player an understanding of how the infection affected the island community. So far, I have written diary extracts, newspaper clippings and military reports to show this. My hope with the written extracts is to give a more personal account of the horrors that these people have endured or in most cases not. As well as written accounts I have used other methods to expand the lore by writing discoverable scenes in the open world, these will be events that the player can stumble upon while exploring. There may not necessarily be a written text, but the clues to what has happened will be present. Working closely with Ryan he has already created some very interesting areas within the game world based on my writing and I am looking forward to expanding on this as development continues. This is my first time writing in someone else’s story and I am enjoying the challenges that this brings with it and I am thankful to all the KYE Creations staff for having me onboard to help. Hello folks! Jaws of Extinction revitalising its AI with a brand new system and we would like to take this time to tell you a bit about it. Although we had a functioning AI system in the Prototype, we were facing a host of issues taking the system in to Early Access. It was therefore decided we needed to re-evaluate the development of AI and so set about creating a new and fancy AIV2 system. A real issue we faced moving forward with the original AI system was that it was not particularly well optimised for the open world of Eden-Nadir. Most issues were about the stuff you don’t see, such as spawning, despawning, how NPC detect each other. These processes had a fair impact on performance within the Prototype. Our concern moving in to Early Access was that these systems would not perform well when scaling up the game to its full, open-world glory. Our shiny new AIV2 system aims to perform much better in an open world environment, by ensuring the NPCs populating the world are not doing any more calculations than they absolutely need to. “Please understand the clip above is not an accurate representation of what the Wanderers will be like the in the game or on-screen NPC count, but is a really fun clip from early in development when doing some stress testing” ~Scrub. Another major factor behind our decision to revamp the AI was control. The original AI system had a number of… interesting features. This was not bad thing, but many of these features were not applicable to the design of the our NPCs. This really complicated the development of new behaviours and NPCs. A fresh start has allowed for a much improved structure to effectively build upon the AI. So what does this mean for the gameplay experience? The NPCs are now lighter in terms of performance. This means we are expecting to have a greater tolerance for more NPCs on screen. Paired with the benefits of having more control over AI systems, we can give the NPCs a greater breath of possible behaviours and add a wider range of NPCs (check out some of the new animals below). As the game processes though Early Access, this new AI framework will be at the centre of further AI developments as we add new humans, wanderers and wildlife alike. We will be covering this a lot more as we develop it further… let us know what you think. Also, we will be releasing a video version of our blog, where you will be able to see all the animated content in much better detail. this will be available on social media and our Youtube channel. Let us know what you thought of our blogs and if you wanted to know anymore information, just send us a tweet or message. Your feedback is always appreciated.